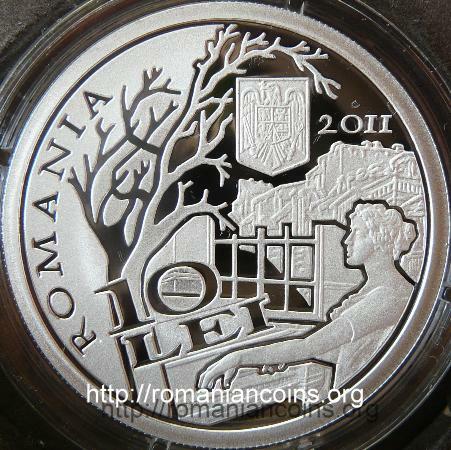 Obverse: ROMANIA, coat of arms of Romania, year 2011, face value "10 LEI", a woman playing piano near a window, a leafless tree and an urban scenery - themes of Bacovia's poems Reverse: bust of Bacovia, years 1881 and 1957 and GEORGE BACOVIA, the room of the poet - a man at his desk, with a candle on it - composition sending to the poem "Singur" (Alone), two verses from the poem: "Stau triste negrele tablouri - Făclia tremură-n oglindă." meaning " Sadly the black paintings stay - The candle shimmers in the mirror." 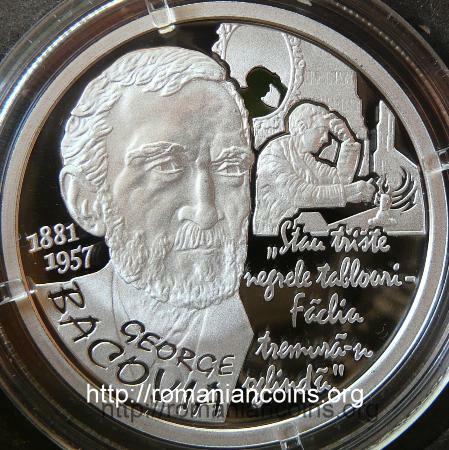 The real name of the poet was George Vasiliu, Bacovia being a pen name. 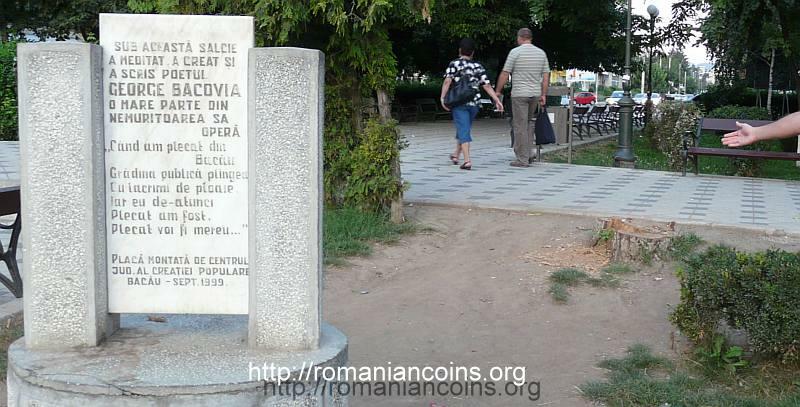 Being grateful to Bacău, the city where he was born, he connected his work to it through the pseudonym he signed with, a fantasy-Latinization: Bacovia. He studied Law at the University of Bucharest. During his stay in the capital city of Romania he frequented the literary cenacle led by the Romanian poet Alexandru Macedonski. 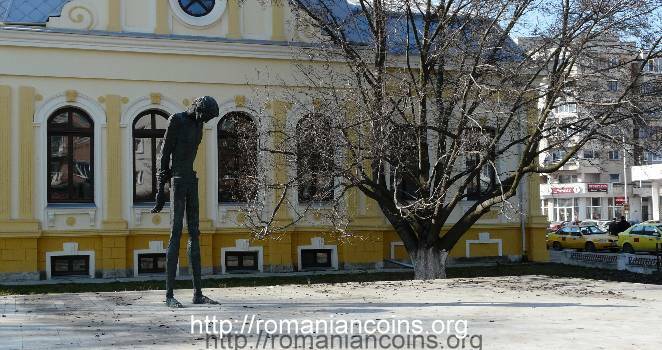 He was transferred to the University of Iaşi, where he graduated in 1911. He never worked as a lawyer; he merely occupied modest positions (copyist, assistant bookkeeper, professor of drawing, librarian and others), in Bacău and in Bucharest, where he finally moved in 1933. Initially ignored by the Communist regime, Bacovia was "rediscovered" in 1955. 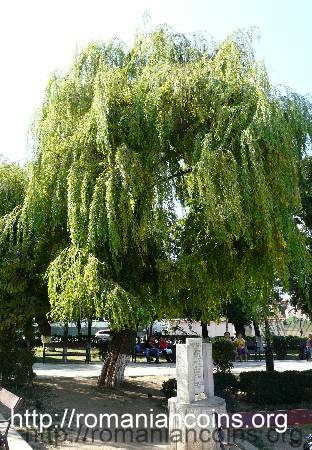 He was decorated with the Order of Labour first class, and he received a monthly pension of 2000 lei (a very large sum at that time). Plumb - Lead, Decor - Scenery, Lacustră - Lacustrine, Amurg violet - Violet Twilight, Cuptor - Oven, Decembre - December, Rar - Rare, Pastel (the last three used as verses for several Romanian songs) are among the best known poems written by Bacovia.